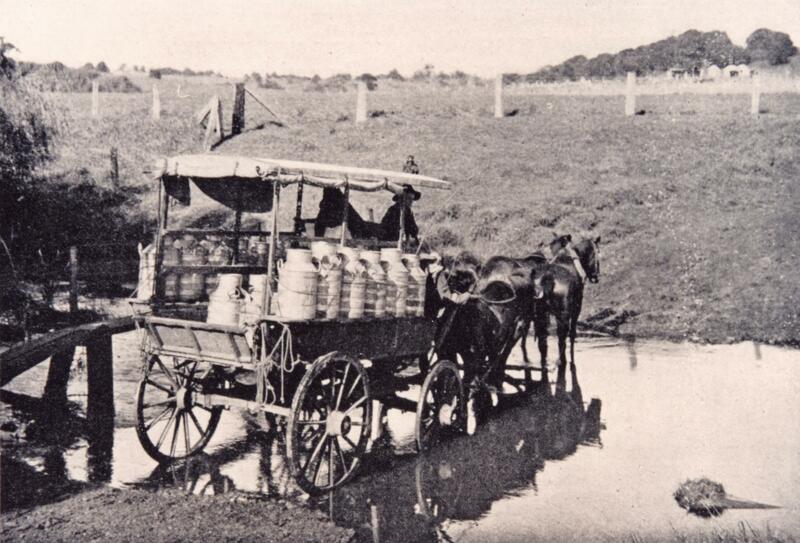 A horse-drawn cream cart, laden with milk cans, crossing a watercourse, c. 1920s. From the Newcastle & Hunter District Historical Society Archives, University of Newcastle, Cultural Collections. Like many small towns in Australia before the arrival of cars, small vans, trucks and rail the commercial life of Kurri Kurri could not have carried on without the horse. Along with the horse you always found blacksmiths, farriers and saddlemakers. Besides the collieries the Cooperative Store was the biggest local owner and employer of horses in the district. The "store horses" carried ice on flat bed lorries drawn by two horses harnessed side by side. Also in this manner, horses delivered groceries or with a single horse, delivered butter and meat often twice a week because people didn't have refrigeration. The bread cart had a small rear door where the pastries, cakes and bread were kept. Small boys knew this could not be seen from the front and would run up behind the passing cart, hang on to the door handle and with feet on the axle, be carried along without being noticed until the driver was alerted by other boys who encouraged the driver to "whip behind"! Horses delivered newspapers in all weathers with the paperboy hurling the paper into the front yard. Horse and cart, carrying coal and other items, [1930s]. From the Newcastle & Hunter District Historical Society Archives, University of Newcastle, Cultural Collections. Coal carters delivered coal to any mineworker. Provided he was a house holder, he was provided with a ton of small coal per year and the cart was pulled by draught horses and the cart was an unsprung tip dray. Later these were replaced by a lorry. There were horse buses which took people from the shops to the railway station. Mail and telegrams were delivered by a horse and rider. 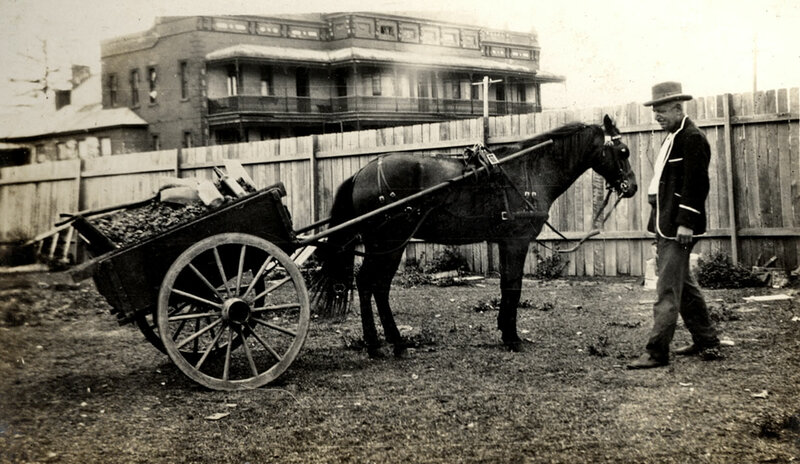 Horses were also used for general store deliveries, garbage removal and sewerage removal. A horse drawn grader was used for road maintenance, midwives arrived with gig or buggy and funeral hearses and ambulances were drawn by a horse. Rabbits were sold from a cart similar to the butcher's cart and was called the "Rabbit Butcher". In East Maitland there was an Aboriginal person who sold clothes props before the rotary clothes line came about. Another familiar shout was the "Bottle-O" - the bottle collector calling from his horse and cart. Horse and bullock teams were used to haul wagons loaded with pit props, or taking logs to saw mills or telegraph poles to rail trucks and goods yards.